So here we are, one year since the forum (a slightly later after-thought) was opened. The domain name Seiko7A38.com was actually first registered on 26th January 2012. I like round numbers - and I'll admit that I had some marginally higher target numbers in mind. But here's where we are as of today, 28th January 2013: 143 members | 249 topics | 2964 posts. Not bad. We finally made it to 3000 posts on the forum - 3 days later. Happy New Year, Paul. Congrats, man. "Not bad", most especially as I remember you had(?) some "keep it small" direction to it, at least when you started it. I think I can safely say we are still 'keeping it small'. We now have a membership of only 150 or so, which compared to the 15,000 plus of the 'new' SCWF (a relative newcomer, in terms of large global watch forums) is absolutely tiny. But I'm still quite content with that. 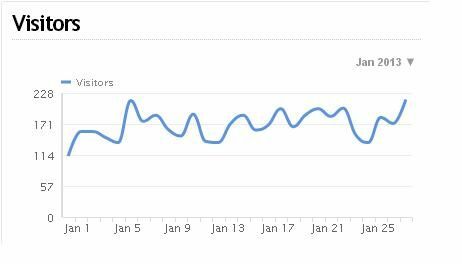 I don't intend to keep publishing monthly statistics, but to demonstrate that January 2013 wasn't a fluke, I decided to monitor February. .... Resulting in two lows of only 74 and 99. The maximum peak of 237 was attributable to an incoming link from the UK RLT forum. Yes, I know what I wrote in the previous post: "I don't intend to keep publishing monthly statistics", but I did capture March too. This month is looking pretty good so far, too, with an opening high of 222 on April 1st. 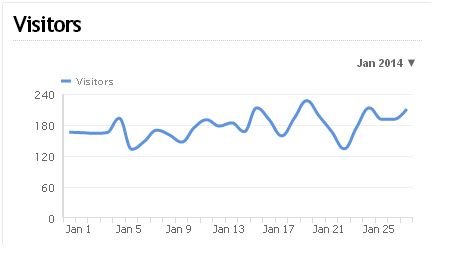 These graphs come from the add-on Clicky statistics package I use to monitor the site traffic / check on incoming google searches. But this isn't the only statistics package available. We've been #1 in the Google search rankings on 'Seiko 7A38' (and almost every model variant thereof, and then some) since the first month the site opened - and that's without my ever having officially submitted the site to Google's search engines. They just found us. But in the greater scheme of things, particularly compared to other 'general interest' watch forums, we're still very much 'small fry'. Last year I very briefly looked at our Alexa rankings and was disappointed. Things appear to have improved somewhat since. 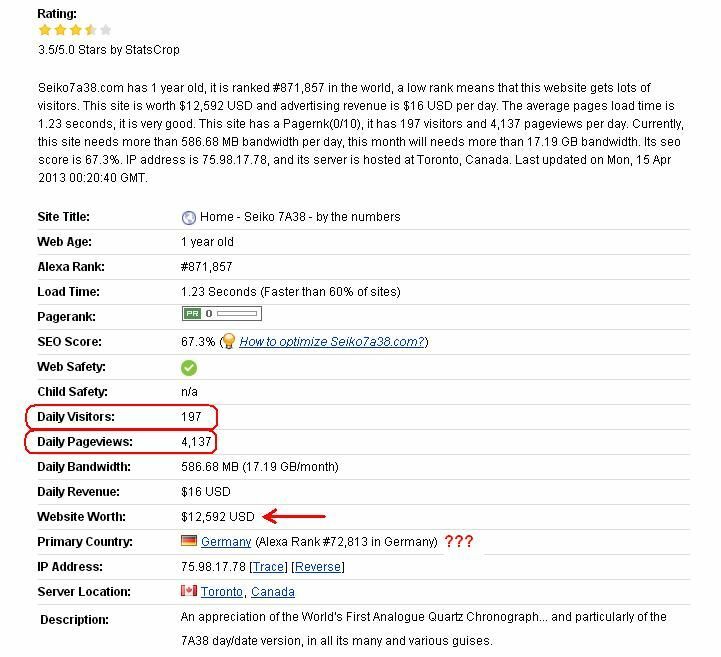 But how the heck do they figure the site is worth $12.5K and that the 'Primary Country' (presumably bulk of traffic) is from Germany ? So here we are 28th January 2014 - it's now two years since the forum was first opened. 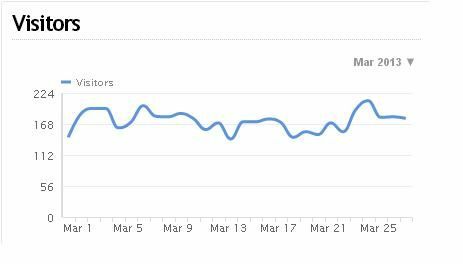 Traffic levels remain about the same; this month's average so far is 175 visitors per day. Today's numbers at the bottom of the forum page read: 314 members | 439 topics | 6359 posts - more than double 12 months ago. Many thanks to all who have contributed so far. Thank you, Paul, for building up this site. I think it's about time I reverted to my original 'keep it small' (and tidy) philosophy. Our 'membership' has recently peaked at over 300 - it's currently theoretically 317*, but over a third of that number are what I'd class as inactive. Later today I'm going to send out an email blast to all members - advising my intention to start deleting passive members. 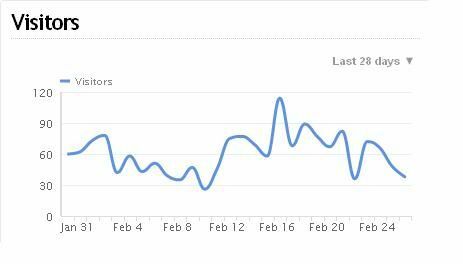 and daily visitor traffic is still steadily increasing. 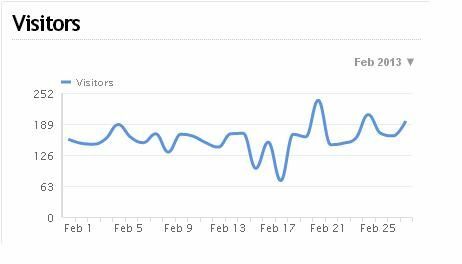 February is currently running at an average of over 200 per day (peaked at 236). This is merely a housekeeping exercise. But if you are already a registered member and have never posted anything, or haven't signed in in 12 months (and there are a good number who fall into that category), ignore the email at your peril. The cull has begun. * It would have been 320 had I not deleted 3 non-contributing 'members' (as a test) earlier this week. See updates to the above in the thread in the Members Lounge section.